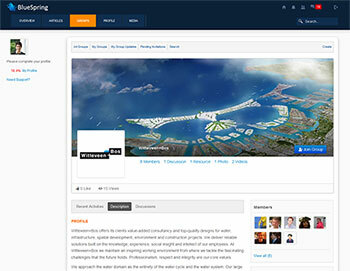 BlueSpring is an online community that gives participants of the Holland Water Challenge a platform to present themselves, connect with peers and interact with professional experts. Participants may join groups that are centred around certain topics, create their own groups, ask questions on the forums, post articles, videos, photos, etc. To organisations and professionals supporting the Holland Water Challenge, BlueSpring offers unique opportunities to connect with young water talent from around the world, announce events, offer career opportunities and exchange expertise. Students and young professionals may create their own profile to show prospective employers what they have to offer and what their personal ambitions are. Companies and organisations of the Dutch water sector are offered to have their own profiles to describe their activities and explain what opportunities they can offer to young talent. Groups are formed around specific topics and business cases to allow members of the groups to share information and participate in discussions. All activities related to the Holland Water Challenge are announced on BlueSpring. Members of the community may also announce their own events. Registration for BlueSpring is free for students and young professionals who participate in one of the Holland Water Challenge programs. Students with a valid university email address are welcome to register at any time.